Frenkie de Jong: Do Barcelona really need him? Barcelona's infatuation with the Ajax youngster is no secret and as the transfer window is coming closer to its commencement, the rumours of Frenkie de Jong joining Barcelona this winter touches new ceiling day by day. The Ajax youth product, without a doubt, is one of the brightest young prospects in world football, and his playing style and tactical intelligence are tailor-made for Barca midfield. Knowing this, it seems fairly legit that the Barca board is planning to go all out for de Jong. but is he really needed? The objective of asking this question becomes fairly clear when you look at Barcelona's midfield and the current crop of youngsters from Barca B. Even if we assume that Busquets, Rakitic and Vidal have not much time left and Denis Suarez will pack his bags sooner or later; breaking into the starting eleven is not going to be easy for Ajax youngster. First, there is Arthur and Coutinho. The Brazilian duo is in Barcelona for less than a year and yet both of them started featuring in the starting lineup fairly regularly and given their age, it is safe to assume that both are going to be here for a while. Next in the line is Carles Alena. The La Masia graduate is the latest addition in the lineup and is capable of playing both in the midfield and in the attack and at just 20 years of age, he is on the right path of becoming one of the fundamental pillars of Barca in the future. Moving on to the B-team, there are Riqui Puig and Oriol Busquets who are constantly knocking on the first team door and were regularly spotted with the first team in training. On top of that, both have already debuted for the first team under Valverde. Also, let's not forget about Sergi Roberto; the converted right-back is first and foremost a top-class midfielder and can get into almost any team in Europe. At just 26 years of age, you can expect him to be here for a long time. Moving on to the potential transfer target apart from De Jong, there is Adrien Rabiot from France who surprisingly emerged as one of the top targets in summer. 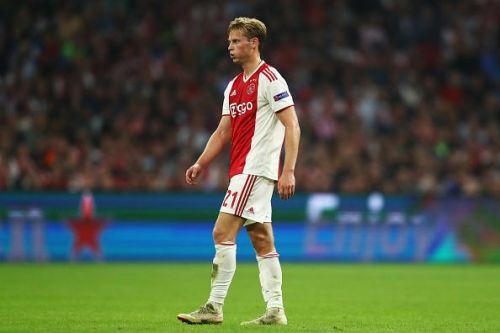 If the 23-year-old midfielder somehow lands at Barcelona, one thing that he is certainly going to do is to make the life of Frenkie de Jong a little more difficult. And this list is not depleted yet. Remember, there is also Monchu and Collado in B-team who would have already debuted for the first team if not for Alena, Puig, and Oriol Busquets. Looking at this list, a natural question that arises is do the Catalans really need to buy one more midfielder of the same mould? Keeping in the mind that Barca generally plays with 3 or at most 4 midfielders, having 10-12 midfielders in the squad seems like an overshoot. On the other hand, De Jong is too much to ignore. Players like him deserve to be at Barca and Barca deserve to have a player of De Jong's calibre. In conclusion, if Frenkie de Jong decides to come to Barcelona, he must be ready for two things; a warm welcome and a cutthroat competition. His determination and character are going to be the major factors which will ultimately decide his life at Barcelona because we have seen far too many examples in recent years of players who have the talent but still failed to handle the pressure. After all, Barcelona is still Barcelona.